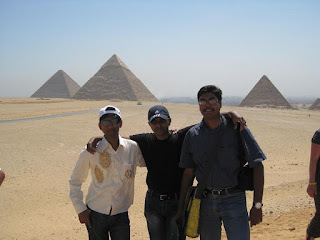 After a long time, the trip to Egypt finalized. We started on Friday eve and landed at the Cairo International airport where Swine flu just knocked the door. We choose Best Way Travel for travel agency and they welcomed us at the airport itself, from where we proceed towards our hotel. Our first day morning started with the illusive glimpse of the great Pyramids from our hotel room window. We just got prepared for our journey in Egypt and had breakfast. We just reached one of the greatest place in the world in 10 mins. 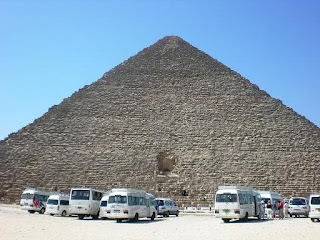 It was the peerless place and deserves to be in the Top 7 wonders of the world - The Great Pyramid of Giza. 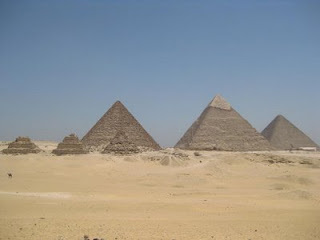 Today, the only ancient world wonder that still exists is the Great Pyramid of Giza. Sometimes you expect more and got less, you feel a bit cramped; but here it was reversed. We feel great and enjoyed here as we didn't feel the humid and hot as we were expecting. Soon we reached at the 3 Pyramids view location. Here people were trying to have some innovative photographs. We also joined and have some. 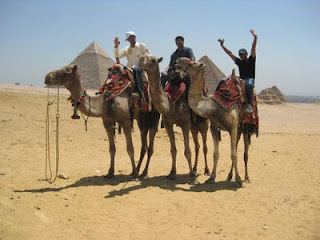 Then we had the camel ride in the desert of Pyramids. They lead us to the point where we have 6 pyramids and 9 pyramids (3 almost broken) views. Giza is the location of the Pyramid of Khufu (also known as the "Great Pyramid" and the "Pyramid of Cheops"), another somewhat smaller Pyramid of Khafre (or Kephren), and the Pyramid of Menkaure (or Mykerinus), along with a number of smaller satellite edifices known as "Queen's pyramids", and the Great Sphinx. 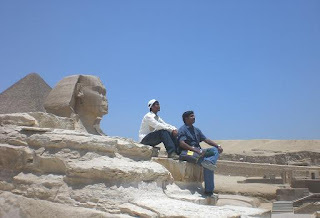 Then we follow our guide to the largest monolith statue in the world, The Great Sphinx of Giza, a statue of a reclining lion with a human head. 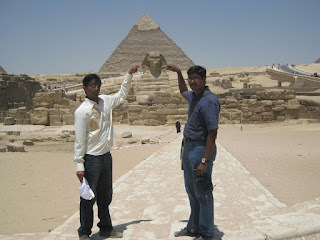 The overall majestic scene was really adorable which have Pyramids in the back of great Sphinx. Then we moved to the Papyrus institute, where we saw a lot of famous Egyptian paintings. Some of them having Egyptian hieroglyphs. 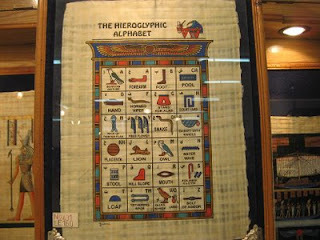 The "Balance of life" "Family Tree" "Good Luck sign" and "Egyptian Calender" were the famous ones. After too much exercise so far, its time for lunch. 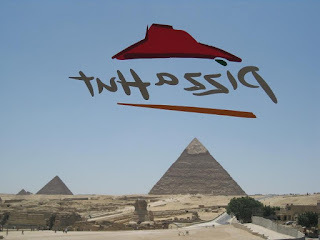 We found Pizza hut just in front of Sphinx gate.We found eye catching location and I couldn't control my fingers to have some Pizza hut ad photographs. 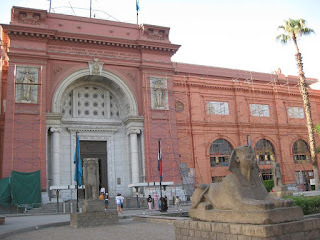 Later on we proceed towards the Egyptian Museum, Museum of Egyptian Antiquities with the most extensive collection of ancient Egyptian antiquities in the world. In the way, we visited one flower cotton collection shop. Snaps & Videos were strictly prohibited inside the museum. The museum contains Royal Mummy room, Mummification process representation, Animal mummy room, and the many treasures of King Tutankhamen along with his gold collection. The remains of many famous Pharaohs are stored in the Egyptian Museum of Antiquities. The museum was so huge, that it will took almost a day to visit. Later on we move to Khan-el-Khalili market for some souvenirs and other stuff. Here I have another refreshing Hibiscus juice. 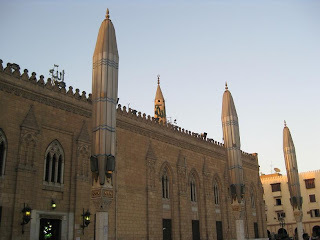 The nearby mosque was another attraction for the locals & visitors. 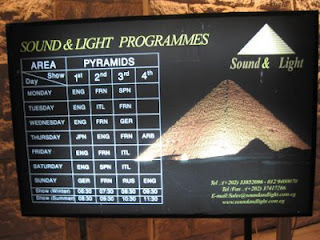 Now, our clock indicated that soon the Light and Sound show will be started at the great pyramids as per our schedule. They have different shows in different languages. We were just on-time so we got the front seats as well. You can see the show as per the language choice and time availability for the better management of your Egypt trip. This was the best time in the whole day, as the breezy air was flowing all around. We enjoyed this time a lot.It was an eye-relaxing and ear-soothing , overall a fabulous laser show. 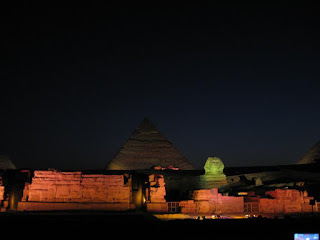 The pyramids seems lovely along with Sphinx when it enlightens with an array of colors. Later on we back to our hotel after dinner, as we have a tiring day, and need a good sleep for the next day schedule. Enjoy the next - Egypt trip - Day 2 and Egypt trip - Day 3.